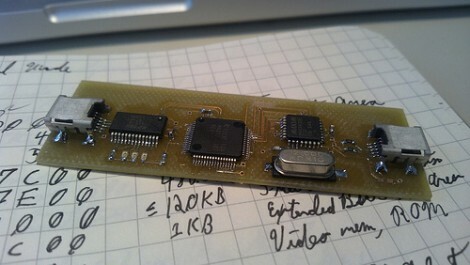 This is the prototype board for [Travis Goodspeed’s] new USB development tool called the Facedancer. He took on the design with USB security exploits in mind, but we think it’s got a lot of potential for plain old development as well. Kudos on the [Frank Herbert] reference when naming the project. Like the characters from the Dune mythology that can perfectly mimic any person they touch, this device let’s you mimic whatever you can imagine. One the USB ports connects to the victim (or host) the other connects to a development machine. Python can then be used to send USB commands in real time. Think of this as doing the same thing the Bus Pirate does for SPI and i2c, except that it’s doing it on the USB protocol itself. This way you can feel your way through all of the road-bumps of developing a new device (or testing an exploit) without the need to continually compile and flash your hardware.